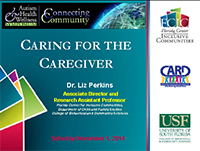 CARD-USF has developed this library of online training presentations that are available for you to view or to download. 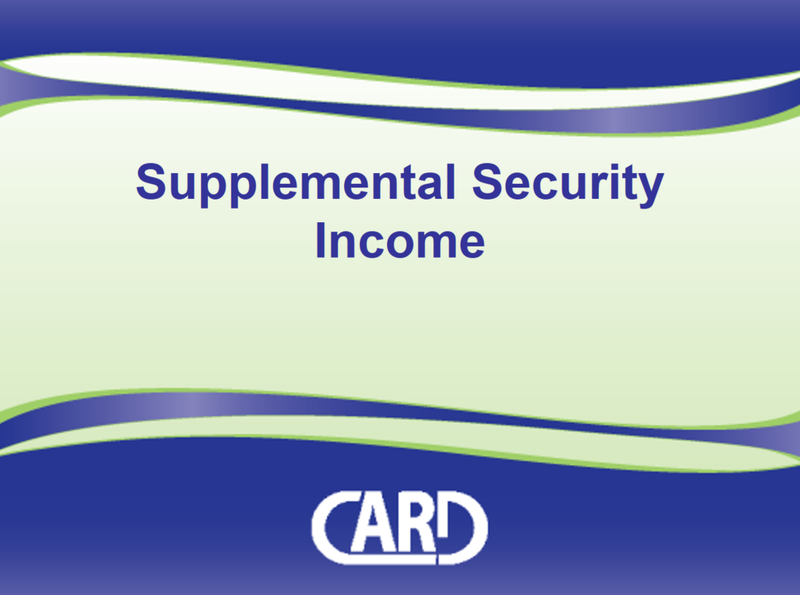 Individuals and families often have challenges when applying for Supplemental Security Income. This presentation provides valuable information on the application process and tips that can help with getting a positive outcome. Participants will learn about Extended School Year Services (ESY), various summer programs and techniques for making other summer activities successful. 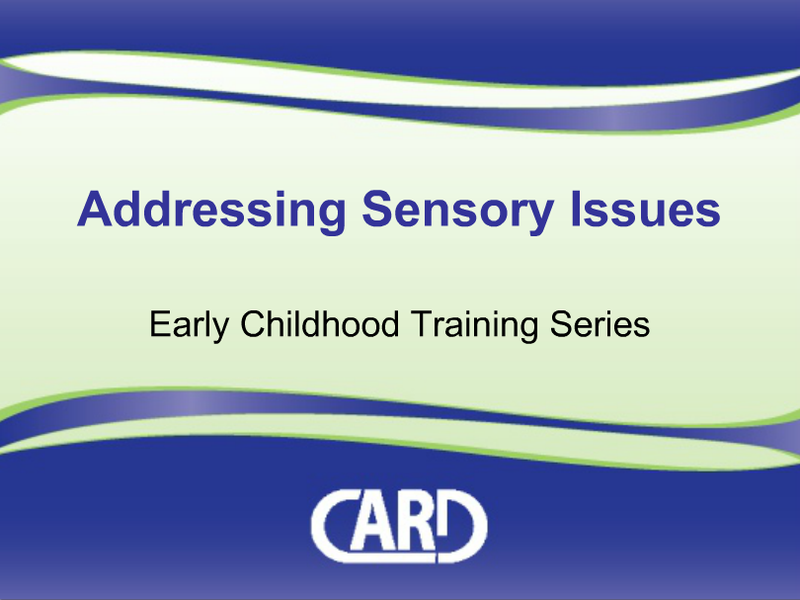 The information in this module addresses Sensory processing disorder and the tools to incorporate sensory activities into a daily routine. 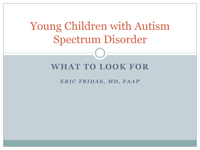 This down-loadable, free multimedia presentation defines and provides basic information about autism spectrum disorders. New training with updated DSM-V information! 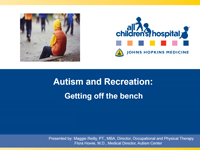 A video presentation detailing Asperger disorder. There are four objectives to this tutorial. They are: To review the milestones of early development and the differences in children with autism spectrum disorders. To identify potential differences in early development that serve as “red flags” for additional evaluation. To provide a brief summary of early childhood screening tools. To illustrate the outcomes of the diagnostic and intervention process through sharing one child’s experience. The story of one family's perspective of their daily life with autism. 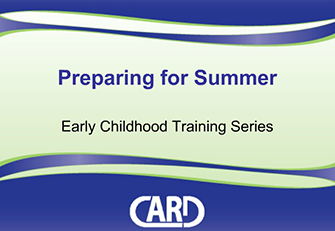 This presentation will provide information about many causes of challenging behavior, strategies for how to predict and prevent behaviors, what to do in the case of a 'meltdown' and an overview of the process of teaching new behaviors in the home through the use of visuals, prompts, reinforcement and positive support. This presentation will provide you with information on using reinforcement in your everyday lives to teach others desirable behaviors. Reinforcement is a powerful tool to increase motivation, teach new skills and build self-esteem in children and adults. This tutorial will guide your understanding of the basic beliefs and concepts that are a starting point for building a positive, effective and long lasting behavior supports for your child. 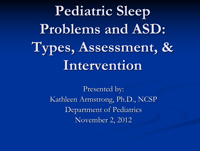 Addressing Sleeping Issues Participants will learn different techniques to reset their child’s sleep cycle. 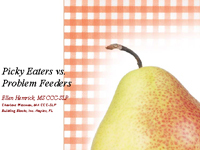 Participants will learn strategies to facilitate the introduction of new foods and expanding their child's food choices. 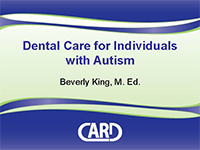 Presentation: "Caring for the Caregiver"
Presentation: "Dental Care for Individuals with ASD"
Presentation: "Critical Pathways to Adulthood: Health Literacy, Communication and Self-Management"
This presentation is the initial module in an ongoing series to provide constituents, families and teachers insight to explaining Algebra in a practical, concrete and visual manner. 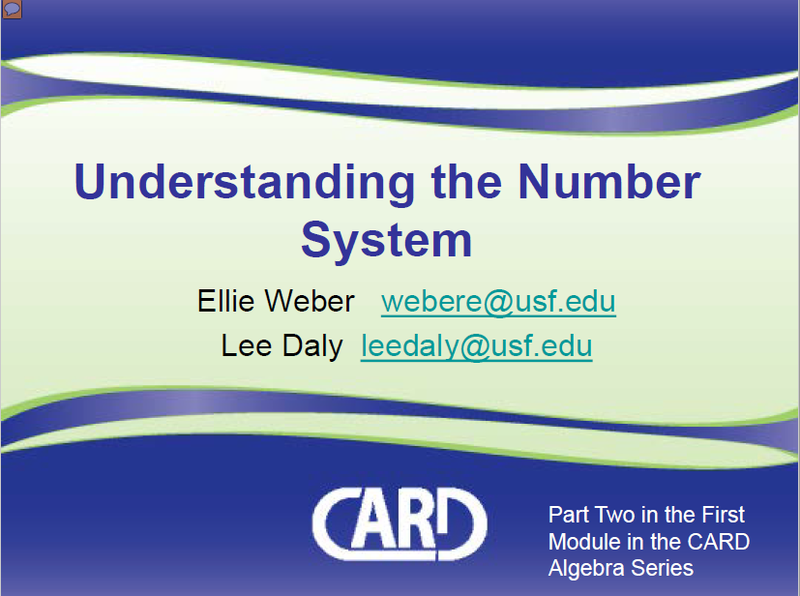 This presentation is Part Two in the First Module in the CARD Algebra Series to provide constituents, families and teachers insight to explaining Algebra in a practical, concrete and visual manner. This module identifies the real number system and concepts that move beyond arithmetic by introducing the use of negative numbers. Concepts to be introduced are real numbers; absolute values; computation of positive and negative number values; and evaluate expressions with letter values. 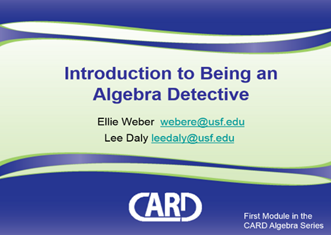 This presentation is the second module of an algebra series, Part 1 of 3, to provide constituents, families and teachers to explore the CARD Algebra Detective’s Tool Box. The concept of algebraic equations and inverse operations are introduced in this module. 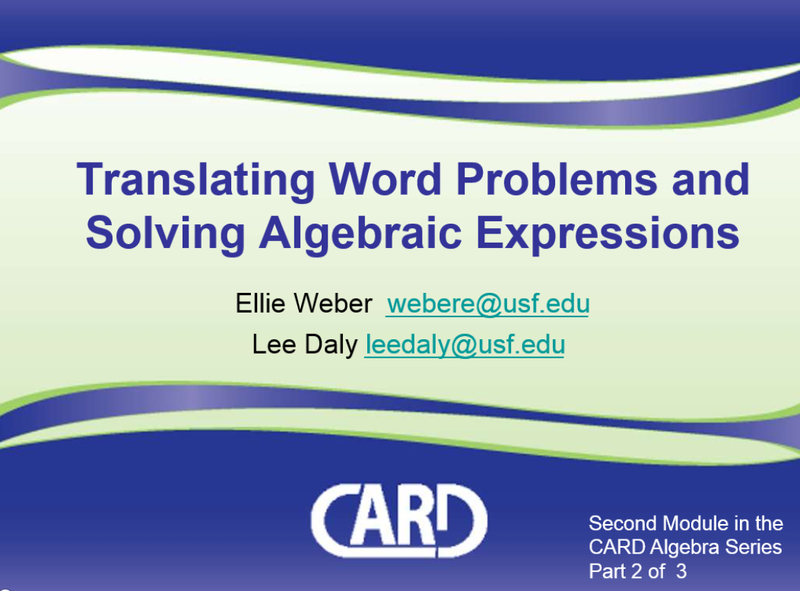 This is part 2 of 3 in the second module of the CARD Algebra Series and explores how to translate the language in word problems into algebraic expressions. 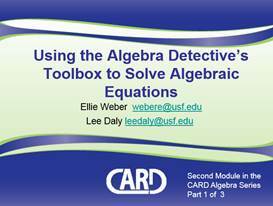 The training incorporates the Algebra Detective’s toolbox and tips for finding key words in word problems in order to correctly translate from words into mathematical expressions and solve them. 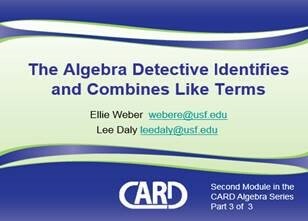 This is part 3 of 3 in the second module of the CARD Algebra Series and explores how to work with algebraic terms, identify and combine like terms, and simplify algebraic expressions. 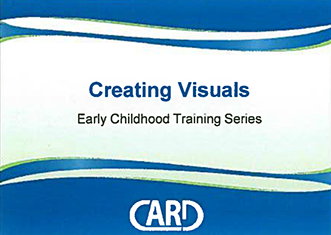 This presentation will introduce various types of visual strategies and their functions. Participants will learn the functional use of visual supports and how they can be used in a child's everyday life. They will also be able to develop a plan for creating and using at least one visual support strategy. This presentation will introduce basic terminology and variety of forms of non-symbolic and symbolic communication. 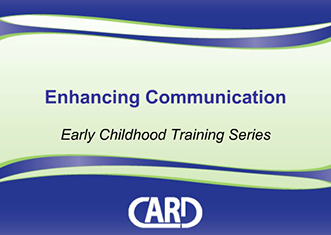 Participants will learn the major milestones of communication and language development and they will become familiar with effective strategies for teaching communication to children with autism. This presentation will provide you with information about the use of cues and prompting strategies, a very important part of teaching a new skill. This module focuses on how to use the guidelines for differentiation along with sound mathematical strategies guided by a responsive decision-making framework so that all students can achieve at the highest level. This module is designed for teachers who want to enhance their skills in teaching students who are experiencing reading difficulties, especially those with significant and persistent difficulties. This module focuses on how to use the guidelines for differentiation along with a high-quality science curriculum guided by a responsive decision-making framework so that each student can achieve at the highest possible level. This presentation will offer strategies for home and school to support students with ASD in learning the science curriculum. This tutorial will show you how to engage in play with your child. Play is important in the development of a child’s language and social skills. This tutorial addresses 3 main areas of toilet training. They are: To identify the challenges associated with toilet training a child with autism. To define the readiness skills needed for toilet training. To provide information about strategies that can be implemented when toilet training a child with autism. This tutorial will provide you with the guidance you will need for choosing the right visual support and constructing it with careful consideration for how your child learns. This tutorial will give information about accommodations and modifications in the classroom and will explain the differences. Administrator Training Video this video will give school administrators information on best practice strategies for both General Education and Special Education classrooms. 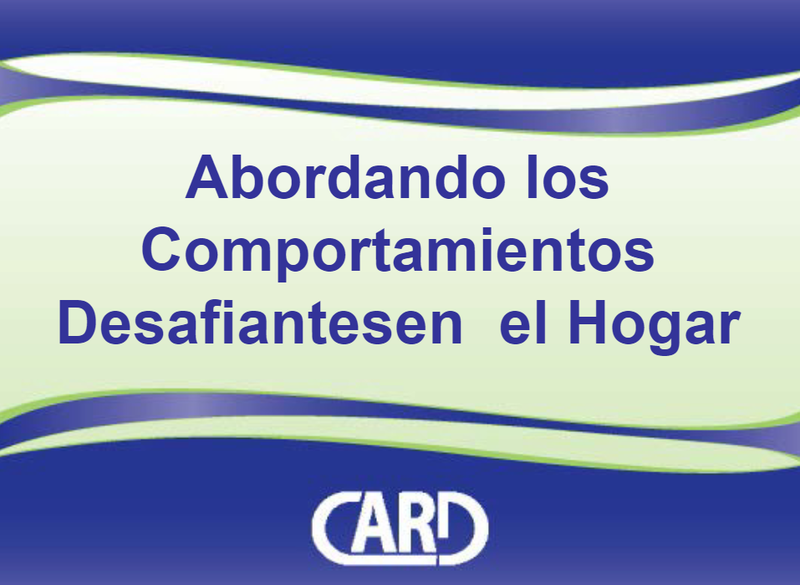 This training is an introduction to a package of materials that includes the items below. 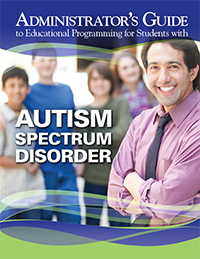 Administrator Guide identifies educational foundations for students with autism, regardless of the classroom setting. Article "Research in Autism Spectrum Disorders" provides evidence for use of the BAU fidelity form. A video detailing inclusion of a student. This tutorial is intended to expand your knowledge of some of the foundational concepts that are a part of teaching not just social skills, but social competence, to students who don’t intuitively understand how to interact successfully with others. This presentation is for educational staff who have some general knowledge about ASD and want to better understand how executive functioning in a student with ASD affects classroom performance. There are examples of classroom strategies to address attention, planning and organization. Provides an overview to the issues and challenges that often occur in the development of literacy skills for students with ASD. This tutorial also provides specific strategies to promote reading abilities for these students. This tutorial will briefly identify 10 things that are most important for getting your school year off to a good start. Some of them you’ll be able to do right away. Others will take a bit of time to establish. By Susan Wilczynski, Ph.D., BCBA. These modules provide a current overview to the findings and implications of the National Standards Report. Modules 1-4 and 6-7 contain interactive quizzes for review of content. An activities matrix is a tool that allows teachers to identify opportunities to address specific instructional targets for these students in the context of typical academic instructional activities. This tutorial will show you how to do it. Participants will learn about the benefits of employment for individuals with ASD, effective workplace supports, and The Learning Academy employment services. This link will take you to the CARD State-Wide Website which includes all CARD sites in the State of Florida and their resources. From The Technical Assistance Center on Social Emotional Intervention for Young Children (TACSEI). This web and teleconference event includes a recorded on-line presentation and a live teleconference discussion during which participants had the opportunity to ask presenters questions about the topic.